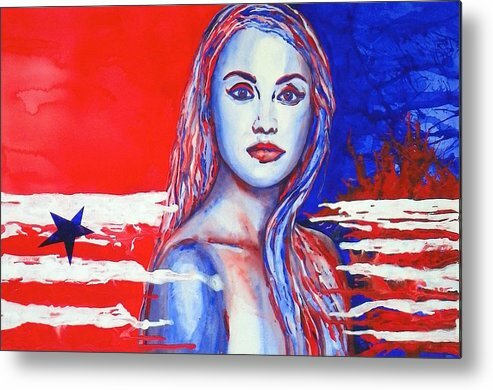 Liberty American Girl by Anna Ruzsan - 10.000" x 6.625"
Liberty American Girl metal print by Anna Ruzsan. Bring your artwork to life with the stylish lines and added depth of a metal print. Your image gets printed directly onto a sheet of 1/16" thick aluminum. The aluminum sheet is offset from the wall by a 3/4" thick wooden frame which is attached to the back. The high gloss of the aluminum sheet complements the rich colors of any image to produce stunning results. Thank you Carol, she is one of my favorites. Thank you Lisa, I'm enjoying being part of contests. Chelsea, Thank you for taking time to look at my work and comment on it! Thomas, Thank you for featuring my painting in your group! I knew you would! I did show it once, and I just entered it to the Artery Show. 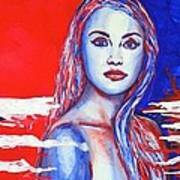 Anna, fantastic use of color and great name. This painting says a great deal. Very deep. 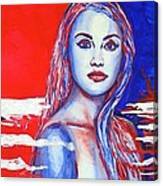 The use of red white and blue in the eyes and hair is brilliant. Have you shown this at any openings? Thank you Karen, it's one of my favorites too! Matted to 24 x 18 ", sold with backing board in Archival Crystal Clear resealable protective bag.